When it comes to desserts in this country, I feel like there are two opposing camps: those who prefer cake and those who side with pie. Well, I suppose there's the third group, championed by my dad, who will take a slice of both, thank you very much...but we'll just humor them for the moment. ;-) I'm a cake girl myself (though I would never turn down a piece of good peach pie). That being said, this time of year, members of both dessert parties tend to pay more than a little attention to that great all-American favorite: apple pie. Served warm with an essential side of melty vanilla ice cream, it's the perfect fall treat to break up the pumpkin dessert obsessions of the season. The trouble is, I've had one too many disappointing slices of that particular pie. You know the kind. That pie that looks so pretty on the outside but is little more than soggy crust and watery apples on the inside. Oh, I know there are zillions of recipes for genuinely delicious versions of the dish. 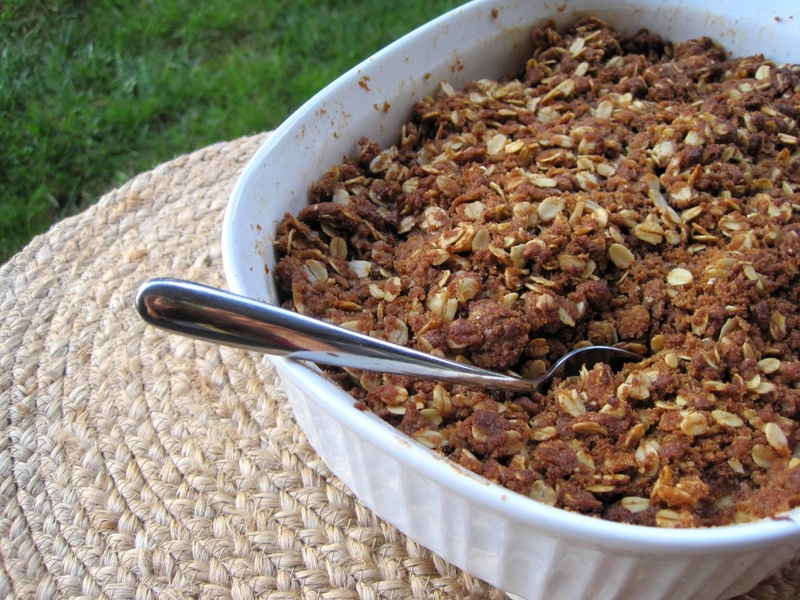 But, in my mind, I'd rather just have one of my childhood favorites...apple crisp. Specifically, my mom's apple crisp. In our home, pie may have reigned supreme during the summer in the form of strawberry, but come fall, it was always pushed aside in favor of our favorite crisp. I'm not sure where my mother got this particular recipe, but it's been our go-to version for as long as I can remember. Try it, and I'm sure you'll understand why. Note: My mom usually increases the recipe a little to fit in a 9x13 inch baking dish by adding a couple of apples, which spreads them out a little and speeds up the cooking time. I actually wanted a slightly thicker finished product this time around, so I stuck with the smaller dish. If you make it in the larger dish, it should definitely be done by 40 minutes. If you go with the smaller dish, you may have to increase the time by 10-15 minutes. Just keep a close eye on it to make sure the topping doesn't get too dark! Place apples in a greased 9x9 inch square pan, spreading evenly. With a pastry cutter, mix the topping ingredients until crumbly. Sprinkle evenly over apples. Bake for 40-45 minutes, covering with aluminum foil if the topping starts to darken too much.